1. Go to the Settings screen to get started. 2. Once you're in the Settings screen, scroll down until you see Blocking Mode option. Another way to get there is by going to shortcuts in the notification bar and then tap and hold on the Blocking Mode icon. Both ways will activate or open up the Settings for you to configure this feature. 3. 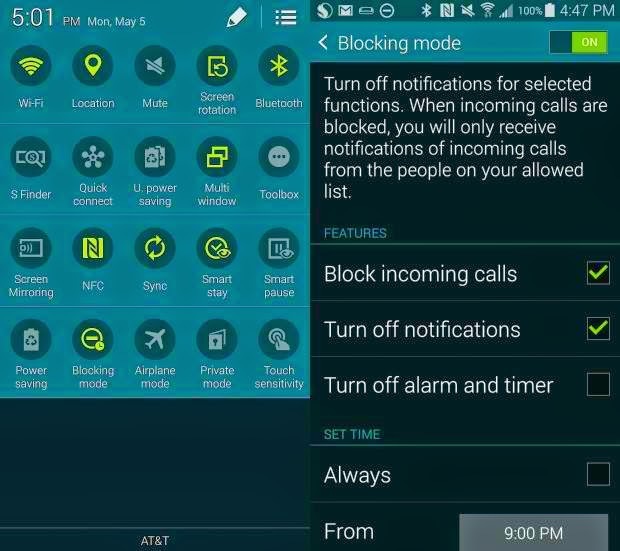 You can turn Blocking Mode on or off at the upper-right portion on the GS5 main screen. In this case, you will need to turn it ON to initiate the setup process. An indication that the Block Mode is already turned on or enabled on the Galaxy S5 is a small circle with a dash icon showing in the status bar. If you see the Blocking Mode is on, you may now begin with the settings configuration. 1. Depending on your preference, you can select what type of alerts or sounds are blocked with the Do Not Disturb style feature. Based on most users' preference, the best options to check are Block incoming calls and Turn off notifications. In case you are using your GS5 phone as an alarm clock, be sure not to put a check mark on the box to Turn Off Alarm and Time. 2. You can also choose when the GS5 Blocking mode is On. If you plan to control it manually, turn on the Blocking Mode feature, otherwise you can set a schedule for it to activate automatically. You can also choose a time to start and stop Blocking Mode if you want. 3. You can also allow specific contacts through even when Blocking Mode is ON. In the final area of the Blocking Mode settings options, you may choose to block all, allow all contacts to call through or choose Favorites or a Custom contact list. Choosing the Favorites option means that anyone in your contact list with a star at the top can call through. A Custom list on the other hand means you can add to the list at the bottom of the Do Not Disturb page. Either you want to enjoy a night of sleep or attend a meeting without any interruptions from unwanted phone calls, the Block Mode or Do Not Disturb function on your Galaxy S5 will take care all of it for you. All you have to do is to first enable or turn on this function on your phone. Hint: When the call is blocked, the display may show the call but it won't make a noise. Also, the caller will not know they are being blocked.